Mobs, those who were antagonistic toward the Mormons, were “heard in every direction” throughout Missouri. The mobs burned houses and crops, rustled cattle, unlawfully detained members of the church, and threatened the Saints with death. 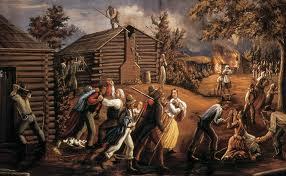 On October 25, 1838, Joseph Smith advised all Saints in outlying areas to move to Far West for safety. Unwilling to abandon his property, Jacob Haun disregarded the Prophet’s counsel and instructed his small community to remain. On October 27, 1838, Governor Boggs issued his infamous order that “The Mormons must be treated as enemies and must be exterminated or driven from the state”. At about 4:00pm on October 30, 1838, a mob of about 240 men approached Haun’s Mill. The women and children ran into the woods, while the men sought protection in the blacksmith ship. The military leader of the Saints swung his hat and called for peace. The response to his plea was the sound of a hundred rifles. The mob shot mercilessly at everyone in sight, including women, elderly men, and children. One of the mobsters defended his killing of a small boy by saying, “If he had lived he would have become a Mormon.” Of those that died, most were shot, but many were killed in the most brutal, heinous fashion. In all, at least 17 people died and 13, including Jacob Haun, were wounded.